Okay. I had to sleep on this review. I couldn’t pull my thoughts together enough after finishing the novel. My jaw was on the floor and my head was a mess. In the best way, of course. 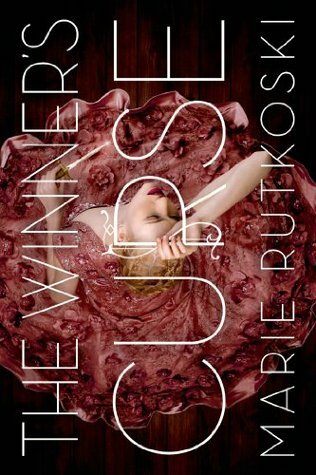 The Winner’s Curse is a book I never thought I needed to read. I wasn’t sure Rutkoski could make me feel the relationship between slave and owner was a real one. There’s so many ways it could have felt wrong, but it never did. Kestrel is the daughter of the general’s daughter. She’s part of the town’s elite, but that doesn’t mean she is treated differently than other people. She must either join the military or marry. She doesn’t want to do either. On a whim, she purchases a slave one day. This goes against everything she feels is right, as she’s one of the few people in the city that feels like owning people isn’t right. But Arin, called Smith in the beginning, comes to her home and the two form an odd relationship. Arin is not what he seems and in him, Kestrel finds someone she doesn’t have to hide from. Kestrel was an amazing character. She’s not a fighter. She’s a strategist. Her abilities with weapons go about as far as protection, but she’s able to strategize and analyze situations better than most people. She’s not a boy-crazy teen. She sees through flirtations and knows her feelings on the people she’s grown up with. She begins to doubt herself when Arin challenges her feelings and beliefs. Despite not being as confident in herself as she was in the beginning, she never loses the belief that she can accomplish whatever she needs to. She is constantly strategizing and figuring out her next best move. Arin is just as amazing. He’s definitely not what he seems, but it provides his character the ability to change. He’s a slave, a resident of the city from before the people were conquered and either killed or sold. He has harbored an anger and resentment towards the people who reduced his people to slaves for 10 years. I did have a hunch about his role in the novel, but that didn’t make me love him any less. His growth from the time Kestrel buys him to the end of the novel is fantastic. I really can’t say much about why I love his character so much without giving away events of the novel, but I can’t wait to read more about him. This novel has twists and turns all the time. Just when I thought I had things figured out, something new was thrown in the mix that left me reeling or picking my jaw off the floor. Like my hunch with Arin, I had thought I knew how the story would go. I was right about some things, but Rutkoski threw me for a loop at times. I was on the edge of my seat. I didn’t want the novel to end, but when it did, I was shocked and needing more. The Winner’s Curse is one of the best world-building books I’ve read. You’re thrown right into the action, but never feel like an outsider. The characters are fantastic and the growth from the beginning of the novel to the end was superb. Rutkoski has an amazing series on her hands and I’m really looking forward to reading what comes next for Kestrel and Arin. This entry was posted in Historical Fiction, Something a Little Different, The Must Reads, Young (and New) Adult and tagged Fantasy, Historical Fiction, Marie Rutkoski, Must-Reads, Young Adult.